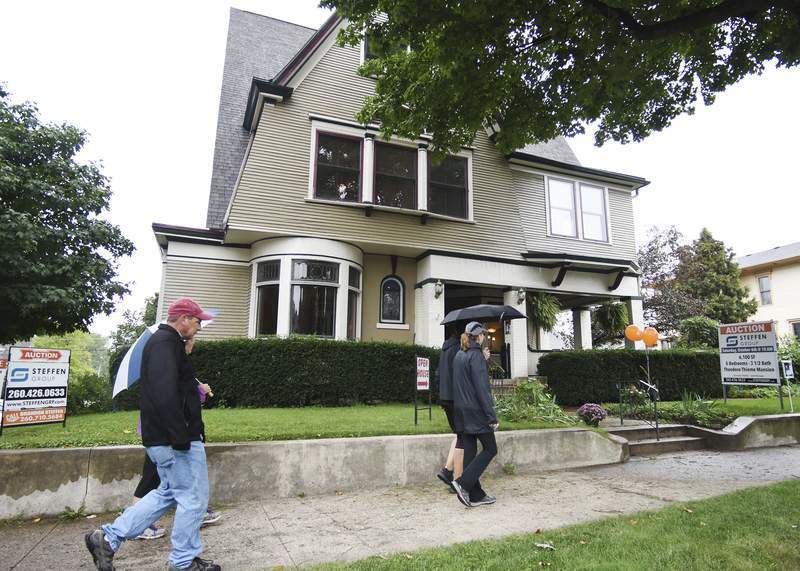 Rachel Von | The Journal Gazette Guests walk in front of the house at 1026 W. Berry St. during the West Central Home and Garden Tour and ArtsFest. 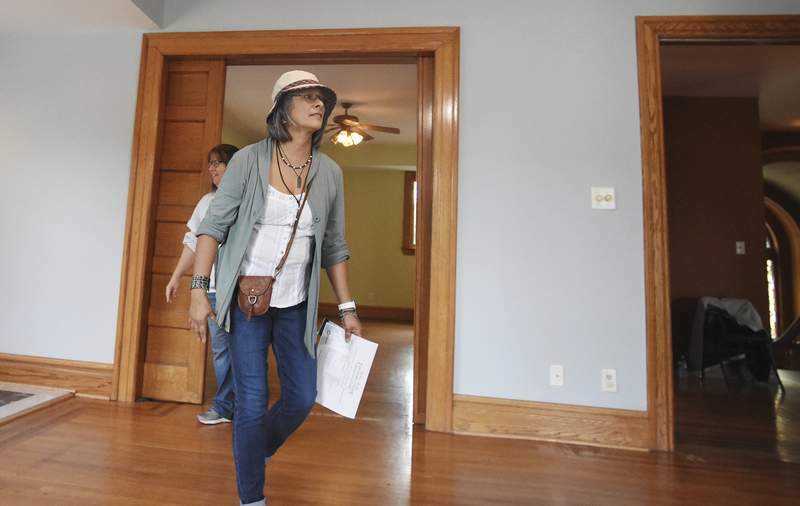 Photos by Rachel Von | The Journal Gazette Teresa Basham tours the home at 1026 W. Berry St. during the 36th annual West Central Home and Garden Tour and ArtsFest on Saturday. 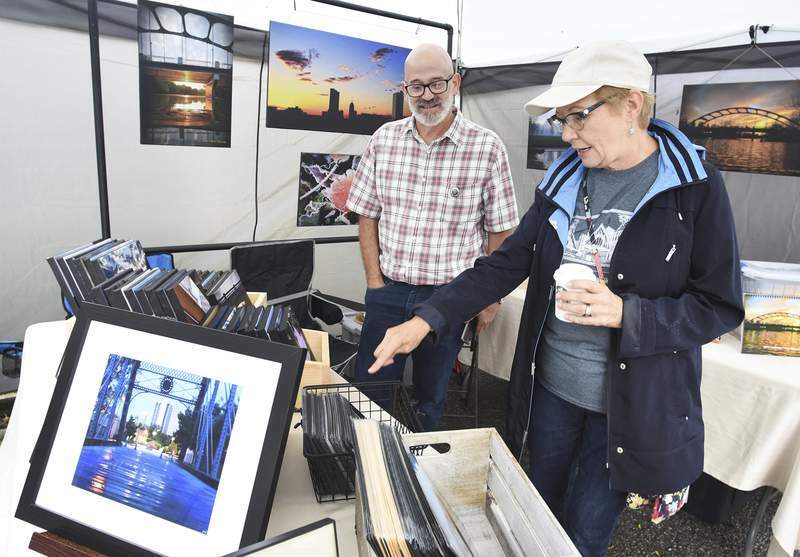 Jonathan Kaufman helps shopper Laura Jackson look through photography he has for sale in his tent during the West Central event. Sam Parker with Wildwoods Grill prepares tacos during the West Central tours. 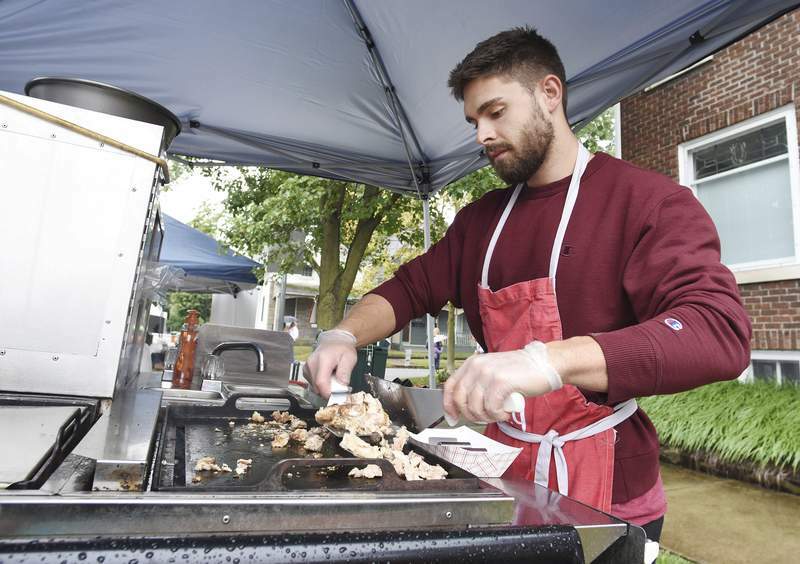 Intermittent showers didn't stop a few hundred people from attending the 36th annual West Central Neighborhood Home and Garden Tour on Saturday. Lines of looky-loos carried colorful umbrellas as they walked the sidewalks along Wayne, Berry and other nearby streets from one tour stop to the next. This year's tour, which continues today, includes 11 stops, artist booths, food trucks, music and free carriage rides for participants. Charlotte Weybright, the tour committee's chairwoman, acknowledged early Saturday afternoon that the wet weather probably prevented some people from attending. She's hoping today will bring drier skies. “But I think we're going to do well because we've got a great lineup this year,” she added. 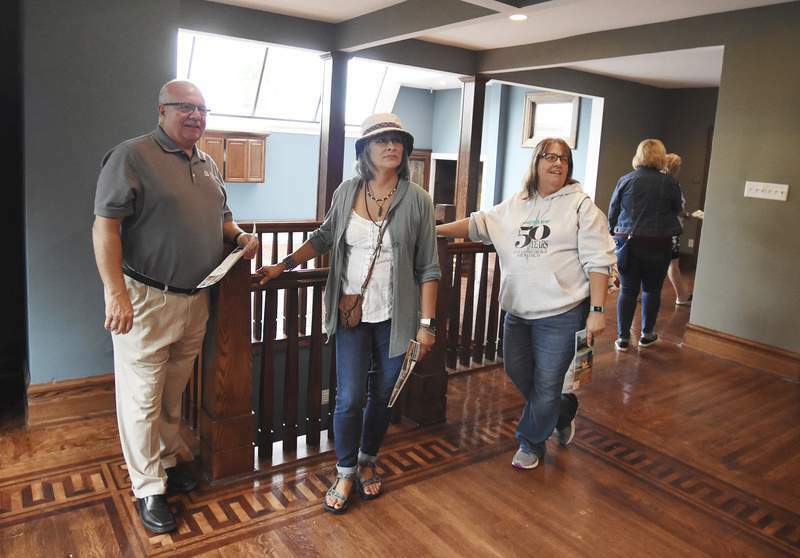 Among the participants are the former GE Club, where local General Electric employees once bowled and played basketball, and a home built in 2017 but designed to fit into the historic neighborhood. A home where the actress Carole Lombard once lived is included in the tour for the first time in about a decade, Weybright said. It has had some work done on it since the last time it was opened to the public. Another home was designed by Joel Roberts Ninde, a pioneering female architect. This year's work-in-progress participant is at 801 W. Berry St. The three-story Victorian, which is more than 7,000 square feet, is being renovated into five large apartments by a new owner. “It is huge,” Weybright said of the home. 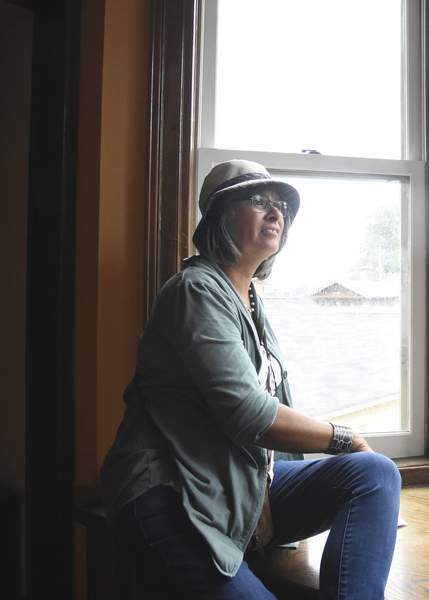 Weybright moved into West Central 23 years ago, indulging her interest in architecture. Jill Starbuck joined the tour Saturday with her young daughter. Last year was her first time. The New Haven woman confessed that she doesn't feel confident decorating her own home. Starbuck isn't able to imagine what a space would look like with different colored walls or a new rug. “I cannot see what's not there,” she added. Cathy Parrot, a potter, and Lori Proffitt, a jewelry maker, sat under a white tent, lamenting the lack of customers. As of midafternoon, Parrot had sold only one piece of her lace-embossed dishes, and Proffitt hadn't sold any pieces. “It's a bummer,” Parrot said, adding that fall weather is always a wild card at outdoor arts events. Weybright said almost 230 admission tickets were pre-sold online. Tickets were also sold in eight local businesses and are available at three places along the tour. People who attended the tour Saturday can use their ticket again today to see any stops they missed, she said. Mike Peden, a West Central resident, enjoys the annual event. He's never opened his home but said he intends to someday.